A sweet twist on traditional Irish soda bread loaded with dried cherries, dark chocolate, and slivered almonds. This simple one-bowl recipe is ready in under an hour! This year for Saint Patrick’s Day, I decided to add a sweet twist to the traditional Irish soda bread recipe. This festive treat is a quick alternative and easy bake that you don’t have to wait hours for the yeast to leaven the dough. The baking powder and eggs do all of the work to help make the dough rise providing instant yumminess with minimal time. This recipe has a more biscuit-like texture, and each bite is filled with tart cherries, dark chocolate chips, and crunchy almonds. The perfect Irish soda bread version for those with a sweet tooth! To create a dessert-like loaf, ingredients like sugar, butter and sweet mix-in’s are used in this recipe. The sugar and butter tenderize the dough and prevent as much less gluten formation compared to a traditional savory Irish soda bread. The texture has a crunchy biscuit-like exterior and a soft and crumbly center. It reminds me of eating a scone, with a thicker crust. The dough for the Irish soda bread is so easy to make! In just one bowl you can mix, then roll and shape each bread. The top of each dough ball is scored with an “X” to help the bread bake evenly, but you can skip this step if you want a more dome-shaped bread. It’s ready for the oven! I was inspired by The Lovely Pantry’s recipe for Irish soda bread that incorporated currants and a sugar glaze. For this Irish soda bread recipe, I added sweet dried cherries, slivered almonds, and chocolate chips to take it over the top. A light sugar glaze is brushed on top of the hot bread right as it leaves the oven. You won’t be able to resist breaking off a piece to nibble on! I served this Irish soda bread with my baked honey mustard corned beef and Irish coffee profiteroles with chocolate whiskey sauce for dessert for a Saint Patrick’s Day celebration feast! You can make this recipe about an hour before eating, so it’s nice a warm when the main course is ready. I hope this year you take a chance on something different for your celebration. You could even make this bread for breakfast to enjoy with some Irish coffee, now that sounds like a good idea! 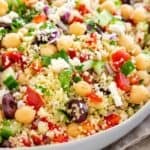 What are some of your favorite Irish recipes? How does butter change the texture of Irish soda bread? This recipe uses butter that yields bread with more of a biscuit-like texture versus a chewy and harder crusted soda bread. In a traditional Irish soda bread, water and flour are mixed and manipulated, then gluten bonds form, giving you a stretchy dough. In this recipe, butter is added to the mixture, and incorporated into the flour. The fat coats some of the proteins in the flour and prevents gluten bonding from happening as easily. Gluten strands are formed but to a much lesser degree. The texture is much more delicate and crumbles much easier, similar to biscuits or scones. A twist on traditional Irish soda bread loaded with dried cherries, dark chocolate, and slivered almonds. Sift flour, sugar, baking powder, baking soda and salt into mixing bowl, stir to combine. Using your fingers, break the chilled butter cubes into small pieces into the flour mixture until the mixture looks like coarse crumbs. Stir in dried cherries, chocolate chips, and almonds. In a small bowl, whisk egg until frothy. Add yogurt and milk to the egg, then whisk to combine. Add the yogurt mixture to the flour mixture, then stir to combine. Remove the dough from bowl and add to a well-floured surface. Knead the dough by hand for about 3 minutes, adding more flour as needed, until thoroughly combined, is no longer sticky, and forms a ball. Form the dough into a ball and cut into two even pieces. Roll each piece into a ball. Cut a shallow X into the surface of the dough ball. Place the two dough rounds on the tray at least 3 inches apart. Bake for 23 to 25 minutes, until the surface, is a light golden brown and a toothpick inserted into the center of the dough comes out clean. Remove the bread from the baking sheet and transfer to a wire rack. Make the sugar glaze by combing 1 teaspoon sugar and 1 teaspoon water in a small bowl, microwave the mixture for 20 seconds. Brush the tops of the bread while still warm. Thank you for the inspiration Lyn! What a great recipe for any time of the year, love how quick and easy it is! This looks so delicious!! I love the combination of dark chocolate and cherries and will be giving this recipe a try!